James Kraig Kahler talks with defense attorneys Tom Haney and Amanda Vogelsberg during his arraignment hearing Monday at Osage County District Court in Lyndon. LYNDON—A man accused of killing his wife, two teenage daughters and his wife’s grandmother in Burlingame will face the death sentence if convicted of the crimes. Monday, at the arraignment of James Kraig Kahler in Osage County District Court, assistant attorney general Amy Hanley notified the defendant, his attorneys and the court of the state’s request for a separate sentencing hearing to determine whether Kahler should be sentenced to death, if convicted. Kahler’s son testified at a preliminary hearing in December, the boy saw Kahler shoot Karen Kahler with a semi-automatic rifle, and heard more shots after he ran from the house. At Monday’s arraignment, Kahler did not respond to Osage County District Judge Phillip Fromme’s request to enter pleas to one charge of capital murder or four counts of first degree murder in the alternative, and one charge of aggravated burglary. “Mr. Kahler wishes to remain silent and have the court enter pleas of not guilty,” said Thomas Haney, one of Kahler’s attorneys. Fromme then entered pleas of not guilty on Kahler’s behalf. Kahler answered Fromme when asked if he understood Haney’s stated agreement to waive the defendant’s right to a speedy trial. As explained by Fromme, the right to a speedy trial allows defendants to face trial within 90 days of arraignment. With all parties in agreement to waive the right to a speedy trial, the judge set Aug. 8 as the start date of a jury trial expected to last at least 10 days. 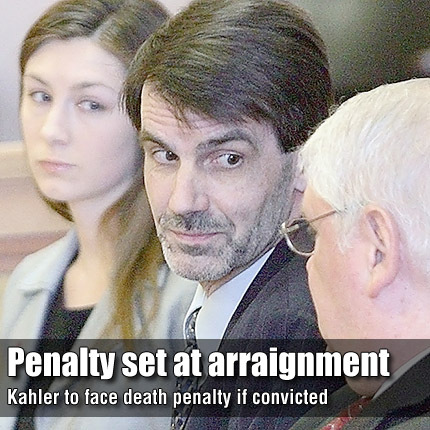 While reading the state’s request for a separate sentencing proceeding, Hanley outlined aggravating circumstances the state will rely on to argue for the death penalty if Kahler is convicted. She said that with respect to the murders, the defendant knowingly or purposely killed more than one person and he committed the crime in an especially heinous, atrocious or cruel manner. She said there were no known circumstances to mitigate a death sentence. The state also reserved the right to amend the list of aggravating and mitigating circumstances. Also at Monday’s hearing, a pretrial conference was set for July 12; motion dates were set for May 17 and June 16.